1955 Mercury Montclair Sun Valley - ONE of only 1,787 cars! Montclair was Mercury's top-of-the-line series and brand new for 1955. And within that series was the Sun Valley moved from the Monterey series - a convertible influenced hardtop that was first introduced the previous year. Featuring a transparent, plexiglass top covering the front half of the roof, it gave a new experience in driving with much more of the outdoors entering your range of vision. 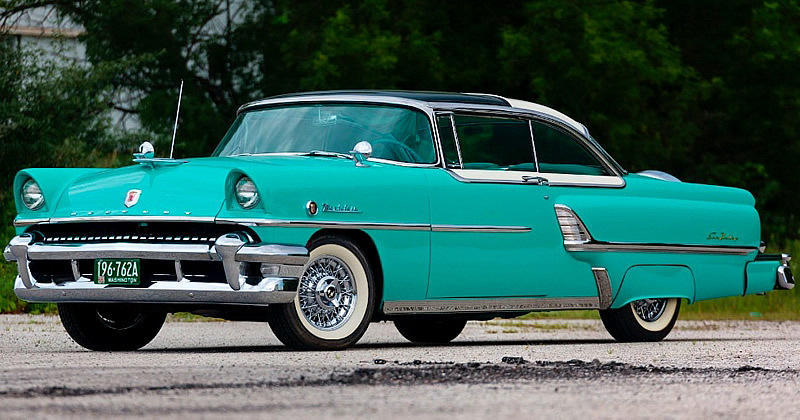 This 1955 Mercury Montclair Sun Valley in Springdale Green is one of only 1,787 cars produced that year. The downside of the plexiglass top is that it would cause a heat buildup inside the car. The Montclair sat slightly lower than other Mercurys giving it a more sporty look. 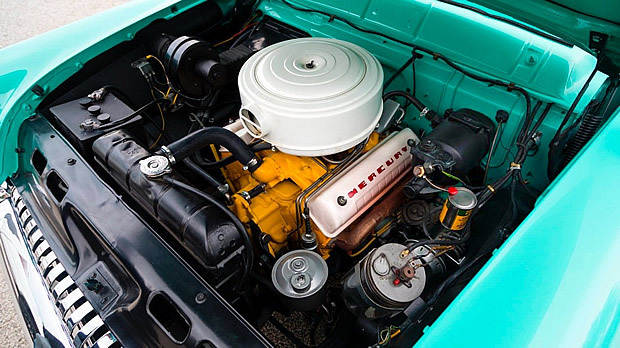 Power comes from a 292 cubic inch Super-Torque V8 engine (new for 1955) with a 4-barrel carburetor producing 188 horsepower. This is paired with the optional Merc-O-Matic automatic transmission and bringing the purchase cost when new, up another $190. Dual exhaust was standard in Montclair. Further options on this particular car include, power windows, powered bench seat, power steering ($108) and power brakes ($45). Mercury made just 1,787 Montclair Sun Valley cars for the 1955 model year. They had a base price of $2,712 and were exactly the same price as the convertible. Sadly the Sun Valley wasn't to last and it was discontinued that year. Ford made 10,000 Fairlane Crown Victoria’s and 603 had the Plexie glass roof they like the Mercury were discontinued with the 56 model. If you are a Ford fan you will see that the dashboard layout of the 55 Mercury is very simular to the 1957 Ford Fairlane . My Dad had a ’55 Crown Victoria that had the same trim on the doors as the Merc’s. Always wondered if it was an option for Ford or just a custom add on. 10/18: In hemmings, someone recently was selling a `56 Montclair ‘Sun Valley’ glass top, claiming FoMoCo made a few `56 models ‘to use up left over plexiglas roof panels’ which was not true at all. The car is convincing enough to look at, but by no means factory produced. Reproduction plexiglas panels are being made for restorers. 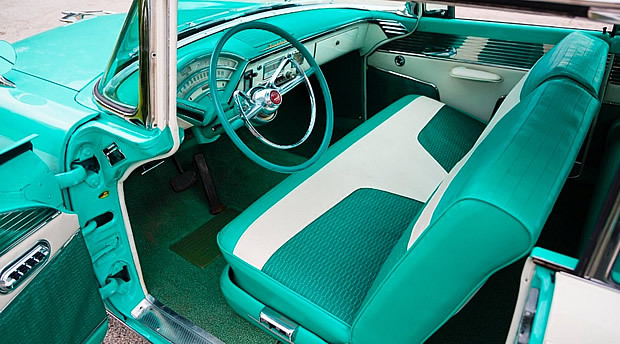 It was turquoise/white, restored, and was listed at under $30K. When I called the supposed ‘seller’ to discuss the car, as soon as he realized I knew more about Sun Valleys than he did, and questioned the authenticity of this `56, he hung up on me. That told me all I needed to know.